“In the last few weeks I have delegated my decision making for the dispatching of our driver to Gene and Liz to take care of each day. I made a new process for the delivery driver on how and when the deliveries will be made. They are in charge of getting the parts pulled and loaded in the Van and creating the route and deliveries in an orderly fashion so that we have efficient, error-free deliveries. “They’ve really taken this opportunity and run with it so I don’t have any worries that it is getting done. I was doing most of this task before and it has really freed me up to focus on other areas and get other higher level tasks done. So, I have gone from a command decision style to a delegating decision making style. There are four possible decision-making styles; each has its place. The skilled manager is not only able to use all four styles well, they know when to use each of the four styles. Command—Command decisions are made without consulting others. If the building is burning down, it is not the time to gather everyone together and involve them in a group decision regarding the best escape route. The person who knows the escape route takes charge! 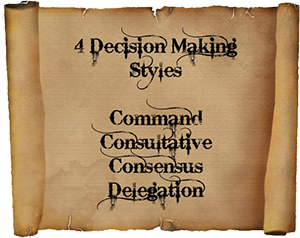 The Command style is best utilized when time is a major factor and when only one individual has knowledge and competency in the area of the decision. and involvement of others who have relevant knowledge or who will be impacted by the decision. This is the most commonly used decision making style and often goes unnoticed in the day to day routine of managing. A strength of consultative decision making is that it is a quick and flexible process for gaining expert information and making informed decisions quickly. Delegation—Delegation (the style that Brian used) is the decision to empower someone else to decide. The person to whom the task is delegated, may then decide which decision making style they will use. A common mistake is countermanding the decision after delegating it. This can be extremely demoralizing. Consensus—Consensus decision making occurs when the team comes together, takes ownership for the decision as a united team, fully considers the facts and alternatives, and agrees on a course of action. Consensus does not necessarily mean that there is 100% agreement. This is most useful with decisions that affect the entire team, and decisions that are complex and require in-depth analysis. 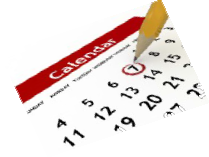 Schedule a Turbo Leadership Systems workshop to help your team make better decisions and raise your bottom line!